I just love Moses. I can relate to him on so many levels. For about forty years, he thought he was an Egyptian...the son of the Pharaoh’s daughter. But somehow he discovered that he was NOT an Egyptian after all. He was a Hebrew, the son of a slave woman. . . and that changed everything. One day Moses was walking among his people and he saw an Egyptian beating a Hebrew slave. Glancing first one way and then another to make sure no one was looking, Moses killed the Egyptian and hid him in the sand. One down. Several million to go. Moses was working the plan. Moses realized what he had done was widely known. The Pharaoh was out to kill him, and his fellow Hebrews mocked him. So he failed and he bailed. Moses fled to a place called Midian, married a gal named Zipporah, and joined the family business taking care of sheep. The next time we see Moses, forty years have passed; he is now 80 years old . . . and he is stuck. Oh, sister, I’ve been there. Have you? Moses was stuck in Midian and held hostage by his failures. He had settled for less than what he was made for. Less than what God had prepared him for. Less than what he had hoped for in himself. And there he stayed. This is where many people drive their tent stakes in the ground and settle. They make a mistake, fall flat on their face, and run away to the far side of the wilderness, hoping no one will notice. Praying everyone will just leave him or her alone, at the same time, absolutely miserable that life has morphed into a monotonous, lackluster checklist. Like Moses, many bury their hopes and dreams to protect their hearts from further disappointment. But that’s not where God wants you to stay. We all fail. We all make mistakes. Peter did. Moses did. Jacob did. Samson did. David did. But just because you failed does not mean you ARE a failure. You are a child of God who makes mistakes. God wasn’t finished with Moses and He’s not finished with you or me. He has a plan...a good and perfect plan. So if you feel stuck...if you’ve failed and bailed to your far side of the wilderness...it’s time to get unstuck and move forward. God has burning bushes all around. This could be one right now. He’s calling you to let go of your failure, move forward in all that He has for you to do, and live bold. Come on. Let’s do it together! He’s calling your name. God, I cringe at the times I’ve let You down. It breaks my heart to think about the times that I’ve failed. But I am so thankful for Your GRACE. Thank You for calling me off the bench and back into the game even when I didn’t feel worthy. I love you so much. Read Jesus’ discussion with Peter, not by a burning bush, but by another burning fire. What had Peter done to let Jesus down? What was Jesus doing during this conversation with Peter? What is Jesus saying to you through today’s devotion? 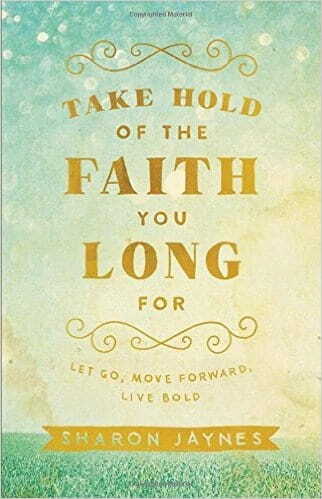 Today’s devotion was taken from my new book, Take Hold of the Faith you Long For: Let God, Move Forward, Live Bold. A mediocre, mundane faith is not your destiny! In Take Hold of the Faith You Long For, I reveal the most common reasons we get stuck in our Christian faith. I show you how to break free of all that holds you back, move forward with all that God promises, and live the adventurous faith of bold believing. It’s time to leave behind feelings of inferiority, insecurity, and inadequacy that hold you hostage and take hold of the mountain-moving faith God intends. Let’s uncover untapped sources of confidence and courage, and see how to move from simply knowing the truth to actually living it out boldly in a life marked by true freedom and expectancy. It’s time to get UNSTUCK! Click on the book cover to discover free bonuses when you order before May 1, 2016.